end tables, filing cabinets, business documents, tools, boxes and totes. 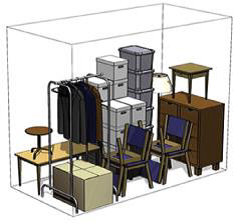 Perfect additional storage space for a small office or condo dwellers. end table, mirror, TV, paintings, boxes, totes or small office items. Condo dweller and small office favorite for additional storage space. 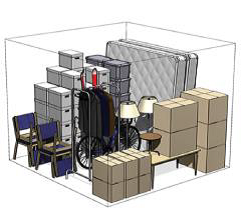 The 10′ x 10′ storage unit can hold the equivalent of a small 1BR apartment/studio or the contents of a large office. Perfect for small-medium business inventory. Items stored in this unit can include; a bed, a dresser, end table, sofa, chairs, coffee table, mirrors, paintings, boxes, containers, TV, etc. A very popular unit. 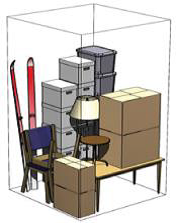 Often tenants take two- to divide their large items from small. armories, sofa, TVs, dining table, chairs, boxes and containers. 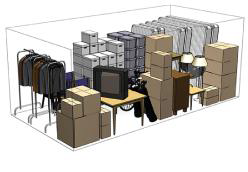 There is enough space for the equivalent of three offices- including desks, computers and filing cabinets. This is a popular size unit used by many businesses for inventory items. dining room set, beds, dressers, armories, TVs, sofas, boxed items/totes/containers, etc. This unit will also hold the content of one vehicle. Very accommodating and practical, commonly used space for a variety of storage uses. 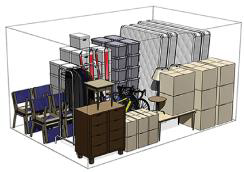 The 10′ x 25′ storage unit gives you many storage options with about 250 square feet of space. Enough space to hold the contents of a 4/5BR home. Also utilized for business inventory/merchandise or vehicle storage. Our 10′ x 30 and 15′ x 30′ units are large business and estate friendly spaces. Seemingly accommodating for many, plentiful and spacious in size. Perfect for large-bulky and/or delicate items such as; art, antiques, sculpture, equipment, displays, merchandise, household items, etc.